Long ago, Maui alii (royalty) held festive gatherings at a beautiful beach in Lele, the ancient name of the storied Lahaina district. In this intimate setting adorned with banana trees, palms and naupaka kahakai, they enjoyed music, dance, good food and a spectacular view of the ocean and the island of Lanai. Price: $105 for adults, $75 for ages 2 through 12. Kamaaina adults pay $75 (no kamaaina discount available for kids). This tradition continues at the Feast at Lele, which opened in April 1999 as a partnership between the owners of the popular Old Lahaina Luau and the award-winning I'o and Pacific 'O restaurants. "The Old Lahaina Luau had long led the industry in 'cultural entertainment' based on authentic practices and values," says Michael Moore, founding partner and director of marketing for the Old Lahaina Luau and the Feast at Lele. "Our challenge was to create a new product that wouldn't be in direct competition with it." According to Moore, the natural step was to expand the Old Lahaina Luau's successful concept -- which is strictly Hawaiian in terms of food and entertainment -- by also showcasing the islands of Tahiti, Samoa and New Zealand. The result is an intimate, sophisticated experience that has the same relaxed, upbeat feeling of a large-scale luau. "Feast at Lele's capacity is limited to 160 guests," says Moore. "Also, instead of group seating, all tables are private, meaning when you make a reservation for two, you are seated at your own table for two." 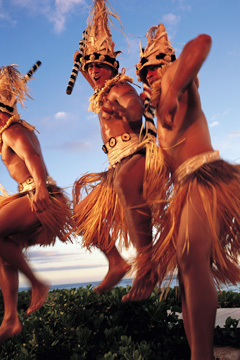 The Maori dances of New Zealand are among the Pacific Island arts represented at the Feast at Lele in Lahaina. THE EVENING begins with a gorgeous sunset, cocktails and a plate full of freshly made banana, taro and sweet potato chips and ginger and seaweed salsa. Mai tais, piña coladas, Lava Flows, Blue Hawaiis and other favorite cocktails are offered at the open bar, but nothing will get you into a celebratory mood faster than the Banana Madness, Feast at Lele's original signature drink. It's pure delight in a glass, with banana purée blended with rum, pineapple juice, coconut milk and Irish Cream liqueur. No buffet line here. Dinner is upscale all the way, from tables set with white linens and candles to the five-course menu created by award-winning executive chef James McDonald, who also oversees the kitchens at I'o and Pacific 'O. "The food at the Feast at Lele is definitely one of the stars of the evening," says Moore. "Each course is based on the traditional foods of a different island group and is served as dances from that particular place are performed." The interaction between the kitchen crew and wait-staff requires as much choreography as the show, but the servers do a fine job of delivering each course on cue and explaining its ingredients and methods of preparation. The entertainment also is precise and polished. There's a great view of the two stages from every seat, but if you happen to be in the first few rows, you'll be close enough to see the twinkle in the dancers' eyes and catch a whiff of their flower leis. It's as if they're performing just for you. 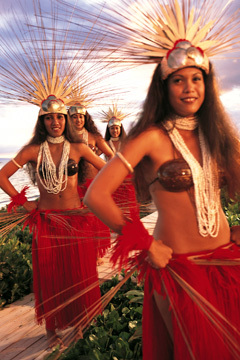 Dancers clothed in the exotic costumes of Tahiti perform to the rhythms of lively drum beats. FEAST AT LELE'S memorable tour of the Pacific begins in Hawaii, the northernmost point in the Polynesian triangle. Both hula kahiko (ancient dances) and hula auana (contemporary dances) are presented as you savor kalua pig roasted in an imu (underground oven), pohole fern shoots and hearts of palm salad, and fresh fish with a mango sauce and tropical fruit salsa. You'll then journey to New Zealand, home of the Maori people. 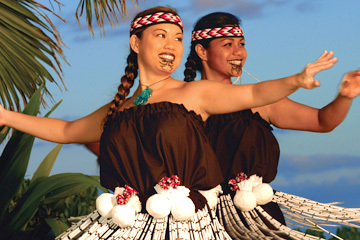 The men perform the haka, an aggressive war dance that was used to intimidate enemies, and the women display their dexterity twirling poi balls, which imitate the actions and rhythms of nature. The second course consists of Maori specialties -- sea bean duck salad with poha berry dressing; kuku patties made of salmon, mussels and scallops; and harore kumara (roasted mushrooms, orange sweet potatoes, onions and garlic). Exotic Tahiti takes center stage next. Lively drumbeats accompany sensual numbers that draw your eyes to dancers' flamboyant costumes and fast-moving hips. Meanwhile, you'll sample baked scallops on the shell; fafa (steamed chicken and taro leaf in coconut milk); and eiota (raw fish marinated in coconut milk with carrots, cucumbers, cilantro, tomatoes and Maui onions). As the show takes place against the Pacific Ocean backdrop, audience members feast on Pacific Island specialties precisely timed to match up with respective islands of Tahiti, Samoa, Hawaii and New Zealand. The evening concludes in Samoa with an energetic slap dance and the mesmerizing fire-knife dance during which two fearless youths spin and toss flaming knives. Samoan specialties served during this segment include palusami (breadfruit cooked with young taro leaf in coconut cream), supasui (grilled steak with a soy, ginger and guava glaze) and fresh shrimp with avocado and papaya in a passion fruit dressing. Dessert is an irresistible quartet of sweets: caramel macadamia nut tart, haupia (coconut pudding), dark chocolate truffles and fresh tropical fruit. "Feast at Lele is more refined than the typical luau in Hawaii," Moore asserts. "Of course, everyone is welcome to attend, but it probably will appeal most to adults who are looking for a romantic evening and a meal that they wouldn't find anywhere else in Hawaii." General manager Randall Baybayan recalls a couple who bought out the Feast at Lele for their wedding. "They had a helicopter drop hundreds of rose and plumeria petals over our grounds," he says. "It was spectacular!" Baybayan also likes to tell the story about high school sweethearts who went away to college and wound up marrying other people. Twelve years later they reconnected at a mutual friend's wedding and discovered that they both had just been through a divorce. They rekindled their romance, and three years later the man decided to propose to his girlfriend during a trip to Hawaii. "He chose the Feast at Lele because a co-worker had raved about our show, food and our beautiful beachfront location," says Baybayan. "He thought it would be the perfect place to propose, and we created a special dessert to display the engagement ring. She said yes!" Over the next 18 months, Moore says, there will be changes that will make the Feast at Lele even more exciting, fun and dramatic. It's hard to imagine they could top what they've got now.